Our second photo contest has been a success so far! This month’s contest beat the March Photo Contest in terms of submissions and I expect we will beat the number of votes as well. Voting will be open from April 8th, 8am Eastern time to April 15th at 12PM Eastern. 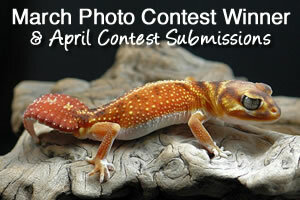 Remember that the winner of this contest receives 25 dubia roaches from BuyDubia.com. Wow, did you all enjoy the March photo contest as much as I did? 19 submissions and 524 votes placed. What a hit! We plan to run this contest each month. If you enjoy it, be sure to let us know in the comments below! 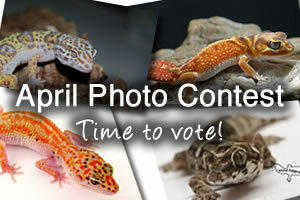 Gecko Time would like to congratulate Stefan Brech of Reptilwelt.de on winning the March photo contest! Stefan has won two months of premium advertising on Gecko Topsites. Stefan won with 40.0% of the votes placed in the contest. Well done! See the full results here.